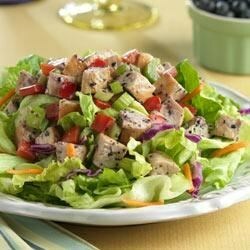 "Crunchy celery and sweet blueberry dressing flavors this chicken salad set atop mixed salad greens." Gently blend all ingredients together and serve over greens. Here’s a simple roast chicken dish that’s bursting with flavor. Mix together, 3/4 cup fresh or frozen blueberries, 1/4 cup low-fat lemon yogurt, 1Tbsp reduced calorie mayonnaise and1 tsp salt until well blended. Chill and serve. Yum... Yuum... Yuuuuuummmmy!!! Healthy extra super duper goodness, and applying volumetrics so that you don't feel cheated or hungry at the end of the meal... EXCELLENCE!